This blueberry smoothie bowl is loaded with blueberries, bananas, almond butter, chia seeds, and coconut. It’s so delicious and nutritious! This post may contain affiliate links. Read my disclosure policy here. This recipe was originally posted on Jun 14, 2017 we’ve tweaked it a bit since then. Start your morning with a blueberry smoothie bowl! Simple fresh ingredients that not only taste amazing but are amazing for you! This smoothie bowl is packed with blueberries, blackberries, bananas, honey, and almond butter. I also added a touch of Greek yogurt to give it a creamy consistency. 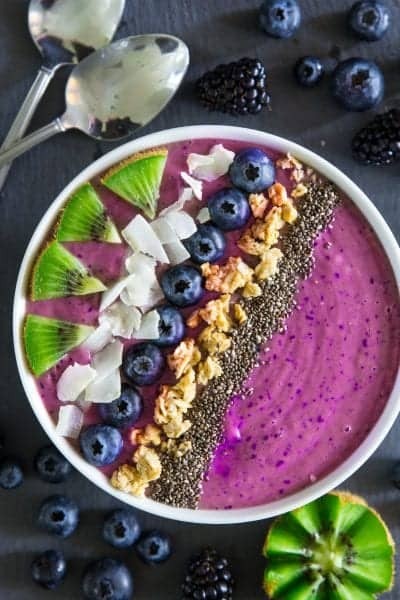 You can leave the blueberry smoothie bowl as is and drink it with a straw (as a smoothie) or place it in a bowl and top it with anything you like. When making smoothie bowls I don’t joke around with my toppings. I added some chopped kiwi, blueberries, crunchy granola, coconut chips, and chia seeds. If that doesn’t sound nutritionally delicious, then I don’t know what does! Place the fruit into a blender, along with the honey, Greek yogurt, and almond butter. Pulse the blender on high until the ingredients obtain a smooth consistency. Pour the blueberry smoothie into a large bowl and top with your favorite toppings. I used kiwi, coconut flakes, chia seeds, and granola on mine. You can either toss the toppings however you want or lay them in an orderly fashion for the sake of nice presentation. 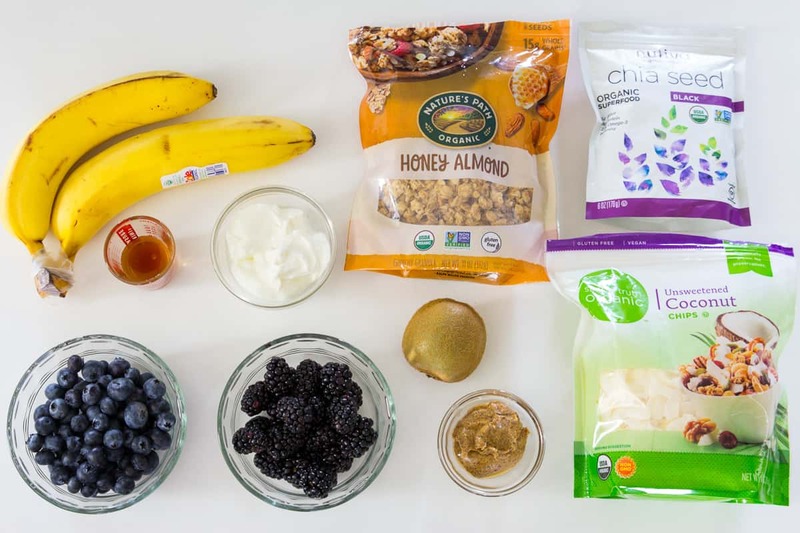 Smoothie bowl toppings could range from dried fruit to nuts, seeds. The possibilities are endless. Here is a list of the most common smoothie bowl toppings. Do you love BLUEBERRIES? Then be sure to check out these amazing blueberry recipes! This blueberry smoothie bowl is loaded with blueberries, bananas, almond butter, chia seeds, and coconut. It's so delicious and nutritious! Place the fruit into a blender, along with the honey, Greek yogurt, and almond butter. Pulse on high until the smoothie becomes a smooth consistency. Serve in a deep bowl and top with you desired amount of chia seeds, coconut chips, and granola.